The goal for every Boy Scout should be attaining the rank of Eagle Scout -- an achievement attained by more than 2 million boys since the first Boy Scout earned the rank in 1912. Last year, nearly 58,000 Scouts, or about 7 percent of registered Boy Scouts, completed Scouting highest rank. 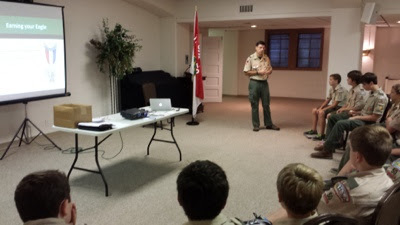 Scoutmaster Baird walked Scouts through the requirements for earning the Eagle Scout rank. These include active participation, demonstration of leadership, rank advancement, service project, and board of review. He also discussed in depth the process for developing, proposing and completing an Eagle Scout service project, as well as preparing for and participating in the Eagle board of review. Scouts pursuing their Eagle and leaders who have supported those efforts contributed to the discussion. 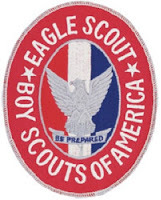 Mr. Baird noted resources within the troop that are available to Scouts, include several leaders who serve the troop as Eagle project coaches and the district as Eagle board of review members. The troop also maintains a page of updated Eagle Scout resources on its website at www.boyscout50.org/Eagle/Eagle_Advancement.html. Saugahatchee District offers additional resources and outlines the district process of reviewing Eagle service projects and preparing for Eagle boards of review at www.saugahatchee.org/program/eagle-advancement. The troop continues to add to its Eagles Nest listing of Eagles affiliated with Troop 50, which is listed at www.boyscout50.org/Eagle/EaglesNest.html. In addition to adding its first Eagle to that list last month, the troop has one Scout sitting for his Eagle board of review and one Scout presenting his Eagle service project proposal tomorrow night.